Submit a new dark-sky site to the directory by clicking here. Directions: from Gainesville take Rt. 24 onto Cedar Key. Follow the signs to the airport. There is space to set up looking out over the Gulf right next to the airstrip. There is very little traffic on this remote part of the Key. Click here to create a map using Mapquest. How are the sky conditions? We stayed here while observing at the excellent Chiefland Astronomy Village site 25 miles up the road and the skies were at least as dark if not darker. There is a small light dome in the SE above a nuclear power station about 50 miles away across the Gulf, but otherwise the skies are very dark. Comments from contributor: When we went to Cedar Key because my wife and daughter wanted to be on the water, little did I realize we were also stumbling across one of the most laid back, nifty observing spots in Florida. We'll be going back again! Feb 26, 2005: The site we have been using for the past few years is the Shell Mound boat launch and fishing dock area. Shell Mound boat launch and fishing dock area is located 4 miles due north of Cedar Key (about 9 miles by car) on the Gulf. Take C-347 off of Rt. 24, follow the signs for Shell Mound and keep going until the road turns to sand, shortly after which you'll find the observing site right next to the water. Jan 17, 2019 (from another contributor): The Shell Mound boat launch ramp is not a good spot because there is a campground there with a bright bathroom light. However, about a mile up the road (Rt. 347), by a causeway bridge, is an excellent place. There is enough room before the bridge rail to pull off the road and since there is nothing except the campground on that road, only 1 car passed all night long. Skies were exceptionally dark, around 21.72 on the Sky Quality Meter. NOTE: Please double check that parking is permitted before setting up. Errors in this listing? Click here to submit corrections. Any restrictions: No restrictions but you will have the $2 per vehicle daily use fee. Directions: From SR 52 and US 301 go South to River Road then east 4.7 miles. Follow pavement onto Auton Road. Park entrance 0.25 miles on left. Click here for a Google Map. Best horizon (direction and approximate altitude cut-off): West - 15 degrees depending where you place your telescope. Worst horizon (direction and approximate altitude cut-off): Northeast - 15 degrees but a little glow. Comments from contributor: Withlacoochee River Park is used by the St. Petersburg Astronomy Club for our dark sky site. We are there on most New Moon Weekends and host our annual star party, the Orange Blossom Special, each year. Visitors are welcome at our monthly viewings, but must preregister for the annual star party. Directions: The observatory is located in Markham Park, a county park in Broward County located at State Road 84 and Weston Rd. State Road 84 runs east and west along side of Interstate 595 separated by only a few yards. 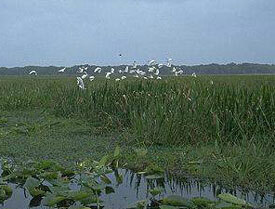 It is not the dark site in the everglades that we use. Going west I-595 becomes Alligator Alley (I-75) at the tollgate, which is about mile marker 30. The dark site is located just west of mile marker 51 and you have to go through an opening in the guardrail before you go over Interceptor Canal. Roads are on both sides of the canal. We use the eastern road that, at one time, was private property that we had permission to use but has now been taken over by the U.S. Government and is blocked off where it enters Indian Property. The road itself is little more than a dirt path and is used mostly by SFAAA members and on rare occasions by some others who are familiar with the road. Once you find the opening in the guardrail you go down and under the bridge and continue south down the road along the canal. You can stop anywhere along the road but our members like to go as far as the gate to the reservation property. It is best to follow members out to the site the first time. Members have been meeting at the observatory on Saturdays near new moon and go out well before dark to set up. Someone is at the observatory every Saturday for "public night" 3 to 4 hours before dark. Click here to create a map using Mapquest. How are the sky conditions? Comments from contributor: This is the dark site of the South Florida Amateur Astronomers Astronomers. Weather permitting , we use this site on or near New Moon every month of the year. Since this site is not easy to find we ask those who are interested in using the site to contact the observatory at (954) 384-0442 and leave a message for the Director or contact us through email via our web site: http://www.sfaaa.org. We will arrange to have you follow someone to the site. The club's observatory is in Markham Park at the edge of the Everglades and the surrounding area is open to all ,at all times. The observatory can be seen from the gate. The everglades dark site is almost exactly in the middle of the everglades along a canal road south of Interstate 595. We like to have someone out there with a cell phone in case it is needed. We have never had any problem with the animals, however, it is a wild area a good sense should prevail. Any restrictions: A $5 overnight camping/access pass is required. The park gates are locked at night, but the rangers will provide you with the lock combination to let yourself out, should you leave before sunrise. park will be about 12 miles south of the intersection of Hwy 21 and SR 16. Watch for the park entrance on your left (east side of road). Click here to create a map using Mapquest. How are the sky conditions? Approximately 55 miles from the center of Jacksonville, there is a light dome to the North Northeast, reasonably good skies to the east and southeast, and some local light domes to the southwest (from Keystone Heights). While not tremendous, it is one of few secure public observing sites to the south of Jacksonville. Comments from contributor: There are a number of places to set up your scope within the park, offering different horizon conditions. The comments above relate to what I feel is the best observing area, located near a large lake on the southeast section of the park (near some cabins). Given the presence of overnight campers, you might have a chance of some non-astronomical neighbors, including the park rangers, stopping by during your earlier hours, car lights ablaze. So if you engage in astrophotography, best to do it during the latter hours. The park is patrolled, and very secure. 2017 correction: Lowered magnitude limits by 0.5 based on reader feedback. Restrictions: None known. Contributor writes that there is "only one resident in the area, and they are astronomer friendly." Directions: Take State Road 80 east from La Belle about 4 miles to County Road 80A "Cowgirl Way." Turn north on 80A and take the first right (Banner). Pull off on any of the roads on the right. How are the sky conditions? There is a small light dome to the west, but otherwise, very good skies north, south and east. M31 Andromeda a naked-eye object. Comments from contributor: Site is best in winter and early spring. Bring mosquito protection at all other times. Editor's note: I'm always a little nervous about advising someone to set up in a highway pull-off, since it is such a "public" location and does represent some possible vulnerabilities. Therefore, I would recommend exercising some caution when using a site like this. Restrictions: Camping permit from Kissimmee River WMA required to stay overnight, no permit required to set up in the evening and leave later that night. Check in with the onsite Campground Host and let him know you'll be there but won't be spending the night. Contributor writes "As of this report (4/10/2015), his name is Bill and he's very friendly but also leaves us to ourselves after we walk over and say hello." Take US-98 south/east as it splits from US-27 (south of Sebring) towards Lorida and Okeechobee. About 20 miles east head north (left) on Lock Access Rd. There is a small blue sign indicating a public boat ramp. If you cross a bridge on US-98 marked "Kissimmee River" or "Okeechobee County" you've gone too far, turn around. Take US-98 north/west from US-441 (downtown Okeechobee). About 25 miles north head north (right) on Lock Access Rd. If you cross a bridge on US-98 mared "Istokpoga Canal" or "Istokpoga Creek" you've gone too far, turn around. Take Lock Access Rd. about 1.4 miles north. You'll see the campground sign on the right. Check in with the Campground Host who lives in a trailer next to a brown state park sign that say, "Campground Host." How are the sky conditions? Excellent darkness for South/Central Florida. A minor glow can be seen to the Northwest, a very minor glow can be seen low in the East. It's safe, easy to find, and attended 24 hours a day. Predators in the area are a minor concern, just some alligators in the water (if you stay away from the water they will stay away from you), raccoons near the garbage cans and mosquitos (bring LOTS of bug spray). Directions: Take I-10 WB to the Sanderson exit, approximately 35 miles west of the I-10 / I-295 interchange. Go north on SR 229 through the town of Sanderson and continue about 6 miles to the north until you enter the Osceola National Forest. Look for a grated Forest Service Road named Fr 276 running off to the right. If you miss the turn, you will be at the intersection of SR 229 and SR 250 in about 1.1 miles. Turn back south on SR 229 and look for the road, now running off to the left. Drive down this grated road about a mile, looking for a large clearing accessible by a dirt road running to the right. The road goes around a borrow pit. The club sets up for observing in the cleared field to the right of the lake as you go in. Click here to create a map using Mapquest. Comments from contributor: This is the dark-sky site for the Northeast Florida Astronomical Society. The club holds observing sessions there twice a month around the New Moon. The site can be hard to find, so look at the maps and contact info at the club's web site. Restrictions: No open fires or alcohol. Directions: Go to Cross City, Florida (Located about 1/2 way between Perry and Gainsville) on US 19. Go south on SR 351 (follow "Horseshoe Beach" sign) for around eight miles then turn south on SR 357 (follow "Shired Island National Wildlife Refuge" sign) for around ten miles. Click here to create a map using Mapquest. Sky conditions: Excellent. One of the darkest skies east of the Mississippi. Seeing is usually above average / excellent, however transparency is usually average or worse. Best horizons: East, South, and West are all excellent to the horizon. Light to moderate tree cover depending on location. Worst horizon: There is a small light dome (Cross City) to the north extending 5-10 degrees up. Five exposed sodium vapor lights located about six miles across the Gulf of Mexico at Horseshoe Beach create a light dome that extends 7-10 degrees up. Comments from contributor: The site is accessible 24/7 with no fee. No open fires or alcohol. Also, perhaps of only geek interest, this site is also a Geocache. This link will take you to the cache.